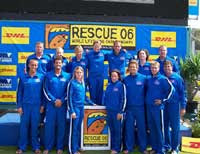 TRIVANDRUM 5 August 2011: Rescue India 2011, the 9th National Lifesaving Sport Championships will be held at LNCPE Swimming Complex and at Kovalam beach, Trivandrum from August 26 to 30. The championship is organised by the Rashtriya Life Saving Society (India) and aims to promote the concept of lifesaving and related sports amongst the youth. The four-day championship will have events like Obstacle Swim, Manikin Carry with Fins, Super Lifesaver, Rescue Medley etc.